Event Description : ART EXHIBITION “Tales of Yore” A Group Art show. Tales of Yore is a fluent march across the sweep of time, aiming to capture nimble human fancies through emblematic art. The exhibition has invited leading artists, sculptors and satirists to open windows to their imaginings of a reality that is unconventional and far removed from everyday trials. Every work of art is a passage its creator travels to tell a story, to make newer discoveries of visions gifted by time and its many paradigms. The conflict between flawless time and the raw innocence of imagination is best captured by the forever pursuits of quizzing minds that artists epitomize. The works featured in the exhibition challenge the status quo, each eponymous to the universe it creates. From paintings and sculptures to lucid outlines, the show demonstrates how a motley clutch of expressionists can breach the matrix of impossibilities. It is through art that the innate verve of the past, the presumed precipice of the present and the imagined contours of the future take shapes, together a logical mosaic but mystically unique in separation. Hidden, however, in the simplicity of the panorama is a metaphysical quest for undefined eternity that makes our webbed senses bloom with magical manifestation. Sandeep Jingdung’s works reflect the experiences of his birth place Assam, which is rich in flora and fauna. His deep connection with natural surroundings, childhood nostalgia and memories add up to infuse life in to his canvas. His art has a capability to take viewers in to mesmerizing rain forest of India. K.S Radhakrishnan’s sculptures reflect history, memory, loss and nostalgia and his deep engagement with the world. His bronze sculptures have a sensuous quality of the extraordinary body movements and often seems as airy, acrobatic, archaic and delicately balancing., Ketna patel portray common themes and reflect the socio-political, cultural identity in everyday life of today and yesterday. She keeps bright colours deliberately in her compositions to highlight passion, politics and tension behind each narrative. Lal Bahadur Singh’s art focus on nature and represent his inner landscape. His paintings seem alive as nature and express his feelings and expressions on canvas with the most beautiful endless colours. Manu Parekh’s landscapes depict his experience of beauty and sheer force of Banaras, an antique city in which many shadows are formed between the light and darkness. The landscapes seem dark with the patches of bright colours, prominent lines and bold brush strokes. Madhvi Parekh depict her childhood memories and imaginary characters in her paintings. Her paintings have a strong sense of design and themes include the images that affect her. Madhvi’s works are inspired by rural India. Paresh Maity’s art reflect his impressions of his travels to many destinations in India and abroad. His painting focuses on figure, specifically faces with countless expressions, closely cropped, fulfilled with bright water colours which amaze the viewer. Seema Kohli’s art works are layered with many stories and focus on feminine subjectivities, her thought, dreams, realities and woman's physical attributes. She uses pure colours and her art seems with a celebration of beauty, sensibility and intimacy. Sanjay Bhattarchaya’s works are mainly about the city life in general and also include religious themes. His paintings are realistic in nature with exquisite detail of light and shade and gives mesmerizing effect. Jayasri Burman’s art is based on mythology, nature and detail. Her work is dream-like and have a lyrical quality. Decorative designs and elements of folk idiom, closeness to nature can be seen in her paintings. He works are derived from the experience of landscapes. Shanti Dave’s works are abstract in form and holistic, he combined old with new, narrative and abstract, big and small with a focus on medium and its possibilities. Shanti use signs ‘Om’, ‘Sri’ and tantric icons to enrich his paper and canvas. Vinita Karim’s works reveals her experiences of her travels and surroundings. Her landscapes seem busy, full of activity, teeming with humans, glorious riots of colours. The quality of dream-like cityscapes reveals beauty and grace in her works. Maya Burman’s art is full of details, pattern and mostly figurative with lot of characters moving everywhere without having a central figure. Her paintings are delicate usually have a fantasy element and have tapestry like effect. Farhad Hussain’s paintings are full of vibrant colours and base his work on the realities of human relationship. He gives minute textile patterning for detailing and his works are narrative with each figure interrelated to each other. Dhruva Mistry’s sculptures are defined in terms of plane, forms and cut-outs and his sculptures change its shape from every angle and appeals intrinsic and beauty of the form and also reflect individual’s interest and curiosity. Arpana’s work are feminine in context, female figures emerge as symbols of solidarity and also on the ancient folk tale of Punjab and Sindh- Sohni and Mahiwal. She draws inspiration from Pahari miniatures. Jogen chowdhury’s art based on the memories,thoughts, dream and his immediate environment. His art is the combination of satire and anger, figuration with flora and fauna and real with imaginary in a fine sensibility and technique. Revati Sharma Sigh’s art is abstract and explore the nature of human society, raises questions pertinent to her country and shows the critical issues that India is facing today. She combined bold colours and thick brush strokes in her paintings. It is those clashing spheres the artists bring together in an entirety. Quite obviously then, drawing upon tales, mythologies and sagas, this artistic repast promises to be like folklore wrung around a warm home-fire, as if the unseen and the unheard are finally coming to life in whispered optimism. The emotive outbursts of the artists are set to guide the course of our beliefs towards a beautiful universe concealed in alternate reality, undisturbed by reasoning. No norms neither genre can make us spectate that universe with bated breath, and that’s the thrill Tales of Yore promises. 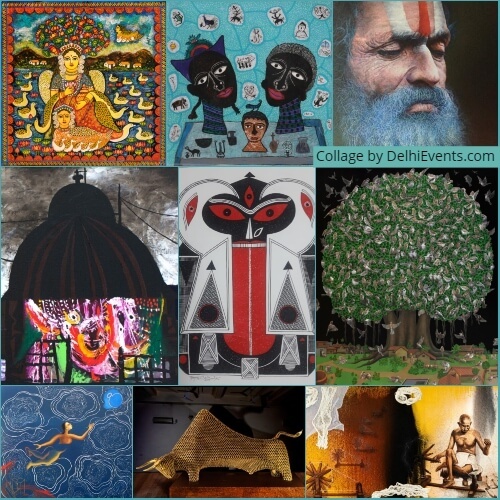 Participating Artists K G Subramanyan, Shanti Dave, Jogen Chowdhary, Manu Parekh, Madhvi Parekh, K S Radhakrishnan, Arpana Caur, Sanjay Bhattacharya, Paresh Maity , Jayasri Burman, Seema Kholi, Vinita Karim, Farhad Hussain, Maya Burman, Revati Sharma Singh, Lal Bahadur Sing, sandeep jigdung.